Premenstrual dysphoric disorder (PMDD), a severe mood disorder, is characterized by mental health and physical symptoms in the week before the onset of menstruation and affects millions of women worldwide[i]. It is a much more intense form of PMS. Most women experience the greatest severity of symptoms from 3-4 days prior to onset of period to up to 3 days’ post-period onset. Symptoms are absent in the post-menstrual week. Why do some women get this disorder? The etiology is still unclear. Many experts believe it is a combination of genetic factors, stress, and the hormonal fluctuation that lead to most of the symptoms. Estrogen exerts potent effects on the brain and is involved in regulating mood, cognition, sleep, eating, and other aspects of behavior. 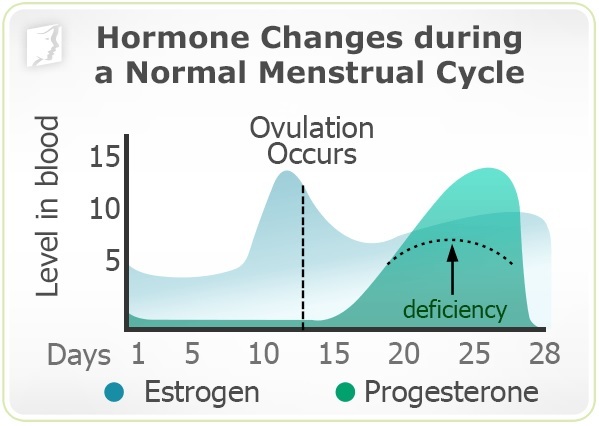 The fluctuations of this hormone during the menstrual cycle, especially during the luteal phase (after ovulation through onset of period) when the levels steadily decline, could be a key factor in the etiology of PMDD. Right after ovulation, your progesterone levels acutely increase and then suddenly fall with menstruation. Research shows that chronic progesterone exposure followed by rapid withdrawal may be another one of the key factors in the etiology of PMDD. 1) First line of treatment for PMDD are Selective Serotonin Reuptake Inhibitors (SSRIs). Unlike with other mood disorders, patient’s with PMDD experience rapid onset of action from SSRI (as opposed to the typical 2-3 week onset time). Therefore, people with PMDD benefit from intermittent dosing. Administering the medication only during the luteal phase, from the time of ovulation until menstruation onset alleviates many of the symptoms. 2) Hormonal therapy: Some women with PMDD respond well to oral contraceptive. In 2006, YAZ, an oral contraceptive, received US Food and Drug Administration (FDA) approval for the treatment of PMDD in women desiring oral contraception. Not all women respond to oral contraceptives and not all oral contraceptives improve symptoms. Please speak with your gynecologist regarding the best options for you. 3) Psychotherapy: A study showed that cognitive-behavioral therapy, one type of psychotherapy, was associated with increased use of effective coping strategies and shift in perception of premenstrual symptoms. 4) Supplements: Calcium was shown to improve PMDD along with Vitamin B6 and Magnesium. Unfortunately, many women with PMDD do not respond to the traditional treatment options. PMDD can cause substantial signs of depression for days or even weeks every month and millions of women are forced to cope with a crippling condition that is very difficult to treat. Recent research shows that Ketamine administered at the onset of PMDD may alleviate the treatment resistant symptoms. Recent data shows that Ketamine actually activates estrogen receptors. Why is this important? As mentioned above, the declining levels of estrogen during the luteal phase may be a contributing factor to PMDD. By administering ketamine at the start of the luteal phase or when symptoms of PMDD become apparent, we may be able to effectively treat one of the big contributing factors. The same study showed that Ketamine works with estrogen to increase glutamate levels. What is glutamate? Glutamate is a neurotransmitter (chemicals that transmit signals in the brain) that may be uniquely central to the biology behind major depression. The lack of glutamate in certain regions of the brain has been strongly linked to depression. Ketamine has been shown to activate glutamate transmission in the brain and is thought to be a key mechanism in its anti-depressant effects. Ketamine may have direct impact on mood and other signs of depression if administered at the onset of PMDD. This is an exciting time as more information becomes available regarding the benefits of Ketamine. More research needs to be done to find definitive answers, but the data we have so far gives us hope that Ketamine may have a beneficial role in the treatment of PMDD. Disclaimer: Dr. June Lee is the medical director of Optimum Ketamine Center. Optimum Ketamine Center website does not provide medical advice, diagnosis, or treatment. Dr. Lee’s blog is not intended for medical diagnosis or treatment. The information provided on this website is intended for general consumer understanding only. The information provided is not intended to be a substitute for professional medical advice. For medical advise or assistance, readers should consult their healthcare professional. Shanmugan S, Estrogen and the prefrontal cortex: towards a new understanding of estrogen’s effects on executive functions in the menopause transition. Epperson CNHum Brain Mapp. 2014 Mar; 35(3):847-65. Smith SS, Ruderman Y, Frye C, Homanics G, Yuan M. Steroid withdrawal in the mouse results in anxiogenic effects of 3alpha, 5beta-THP: a possible model of premenstrual dysphoric disorder. Psychopharmacology (Berl) 2006;186:323–33. ACOG: ACOG Practice Bulletin Premenstrual syndrome. Clinical management guidelines for obstetrician-gynecologists. Int J Obstet Gynecol. 2001;73:183-91. Steinberg EM, Cardosos GMP, Martinez PE, Rubinow DR Rapid response to fluoxetine in women with premenstrual dysphoric disorder. Depress Anxiety. 2012;29:531-40. Freeman EW. Luteal phase administration of agents for the treatment of premenstrual dysphoric disorder. CNS Drugs. 2004;18:453-68. Kleinstauber M Witthoft M. Cognitive-behavioral and pharmacological interventions for premenstrual syndrome or premenstrual dysphoric disorder: a met-analysis. J Clin Psychol Med Settings. 2012;19:308-19. Kleijnen J, Ter Riet G et al. Vitamin B6 in the treatment of the premenstrual syndrome- a review. Br J Obstet Gynaecol 1990;97:847-52. Khine K, Rosenstein DL et al. Magnesium retention and mood effects after intravenous infusion in premenstrual dysphoric disorder. Biol Psychiatry 2006;59:327-33. Ho, Correia, Ingle Ketamine and ketamine metabolites as novel estrogen receptor ligands: Induction of cytochrome P450 and AMPA glutamate receptor gene expression. Biovhem Parmacol. 2018 June;152:279-292. This entry was posted in Blog, Depression and tagged Ketamine Treatment Chicago, Premenstrual Dysphoric Disorder Treatment. Bookmark the permalink. Please fill in the form below to request a FREE consultation from one of our staff members.